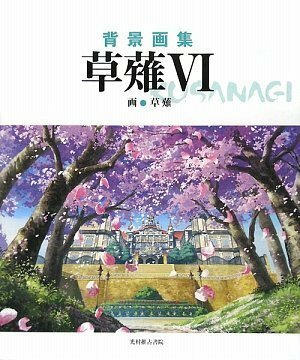 草薙 (Kusanagi) is a Japanese artist group that creates background art for animation and computer games. This is their sixth art book and it focuses on video game art. If you've played these games on PlayStation 2 or Nintendo DS, you'll find these illustrations familiar. They are the in-game backgrounds the characters walk on. Many of the pieces have accompanying black and white line art. The are is really beautiful. Unfortunately, they are a bit small as two to three are put to a page, with the line art. It's hard to enjoy the details compared to the larger full page paintings, which are gorgeous. Many of these look water colour painted to me. The mood created is fantastic. My favourite piece is the aerial view of the castle from Quiz Academy 6. It feels so real, like that such a beautiful place really exist. And I've not even played that game before. This book is recommended to background and video game artists. Thanks for showing this, I been trying to find an artbook with the suikoden backgrounds! Thank you for your great review! Do you know if a volume 7 has come out yet? I've googled but haven't found much of anything.... Thanks!